Two books usually give someone a good feel for an author’s writing style, in terms of their stylistic approaches and the choices they make with characters. But I’m not quite sure about that still, as I’m once again left with the same complicated reaction that I had after reading “Cruel Beauty”. With “Gilded Ashes” though I liked the story significantly less, and found there to be more issues. “Gilded Ashes” presents a similar dark twist on a familiar fairytale, returning with bargaining demons and Greek mythology woven into the otherwise very Western-European retelling. But this time, the main character Maia was much more dislikable and problematic. As some pointed out, I didn’t get why she simply went along with her lies and pretense of being happy. If you want your mother’s ghost to stay but hate her cruel ways, why don’t you try reasoning with her first? And if that doesn’t work, well, perhaps then her choice in the end should’ve occurred earlier, in order to spare everyone the pain and terror that occurred throughout the novella. She seemed much more selfish and difficult to place. Nyx also had a slightly selfish streak in “Cruel Beauty”, but she was much wittier, and what’s more I BELIEVED that she was quirky and witty. Maia didn’t sell this point very well. Her conversations with the prince in the beginning were confusing, and her strategy to convince him that he needed to marry her stepsister were odd. No wonder the prince didn’t go along with it. The Greek mythology also felt out of place this time, overloaded and at times even seeming to intrude into the writing, with the references to household gods and Zeus and Hera, among other deities. This mainly was due to the shortness of the story, I think, which meant that there was very little time to ease the reader into the world of Acadia and make the lifestyle feel plausible and natural. The whole story felt very rushed and false, like the heart and effort that was put into “Cruel Beauty” was missing this time around. It was a very quick read, but a very unengaging one. There were problems left, right, and center, making for a predictable and complicated retelling that tried putting forward something new but ultimately ended up getting tangled in its own retelling. 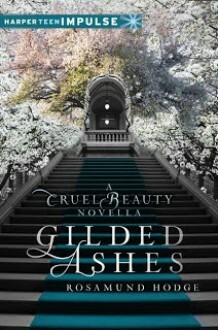 Maybe it’s because it’s a novella, but “Gilded Ashes” just felt like a story that was written based on the wave of publicity and enthusiasm for “Cruel Beauty”. It lacked a lot for me, although it was interesting enough for me to quickly plow through it, an easy but most likely forgettable read. I hope “Crimson Bound” will change my mind and really utilize all the potential I could feel sitting there in the words and shooting past me without sinking in. I almost want to read how this book is some kind of parody about how YA fiction is. But even the book I'm reading that's supposed to be a parody of all the terrible of YA fiction IS TILL BETTER THAN THIS BOOK. Let's just start off with the misogyny. EVERY. SINGLE. WOMAN. Is hated on in this book. Even the sister and mother. Even some random NPC secretary. All the men are noble and awesome and great. Even when they are evil itself, they are still given more agency than the women. 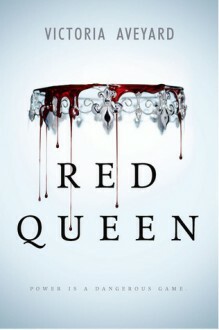 I also had high hopes for this book subverting tropes. You don't need to be psychic to predict how this book is going to turn out. Alpha males good, Beta males are EVIL. That's not even a spoiler at this point. There's a "B**ch Posse" with Evageline. "He's so misunderstoooood!" and just like. YOu an see EVERYTHING coming a mile away and it leaves you shaking your head going "No the book wouldn't go there?" BUT IT DOES! This also has a healthy dose of "NOT ALL OPPRESSIVE MAJORITY! ", which is the thing that just kills this book entirely. Every character in this book is also one dimensional. Evil Queen, Evil Fiancee, etc. Even the names are 1D. Osanos... Ocean, uses water. Even one house called Viper with black and green as the colors... like Syltherin. Did I mention the houses and the colors. This place is like dinner theatre Mideval Times in Florida. Let's not even go into the "We have no idea what a 'coup d’état' despite the fact we kill each other." There are many moments of that in this book as well. 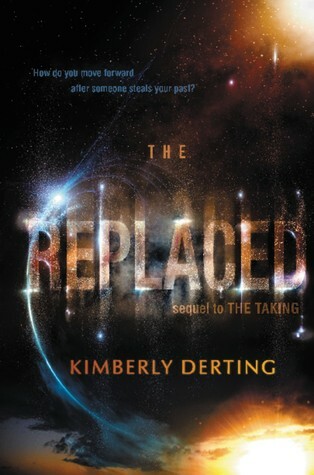 Romantic and action-packed, The Replaced is the gripping second installment in the Taking trilogy. Although I did like this one, I wasn't as big a fan of it as I was of its predecessor. I;m pretty sure it was only because of me, because I just don't like on the run or road trip books as much as others. It may be the fact that they have too much time interacting with all the same characters. In this second installment, Kyra is on the run from the NSA along with a group of others that have been Taken. But then the group gets a message that Tyler and who they think is her father are alive... Naturally this sparks some interest in them all and they decide as a group if they think its a trap or if it's safe for them to go find them. As they set on the road to escape the NSA once again, things start to heat up! "Because here's the thing. If I could dream, it would be of him. Tyler But dreaming was one of those things only afforded to those who could sleep.'" The action in this one was good, but there was too little of it. Either that or I'm not a huge fan of stories where the characters are on the run or on road trips. But at the same time, I was ok with it because when there were things going on, they were very good things. It felt like a filler book, but towards the end so many things were revealed. Some things I figured out and some others where I was left with an open mouth. "Memory was a tricky thing.'" As for the romance, I wasn't a fan of it in the first one and I'm still not a fan of it now. This is one ship I'm not on. It is still just too weird for me. I like them individually and I love how sweet he is, but it's just weird for them to be together. But with the "other" boy, I was very happy and wished that it would end up there. Buttttt of course Derting had other plans BECAUSE THAT ENDING THO. Why?! How am I supposed to wait this long for the next book? I need to know what the hell is going on! The ending to this one was kinda creepy. I can't wait to read the final book! "It's your memories and life experiences, your hopes and fears and dreams and passions, that make you who you are....'"
I know I loved a book when I have to start and stop a review several times and I'm still unsure I've found the right words for it, This is one of those circumstances. I'll Meet You There is a swoony, funny, sarcastic, and just everything you need from a book. "Being a Marine isn't the only thing you're good at. Maybe you just don't know your thing yet, you know? I think..." I took a breath "I just think you're selling yourself short.'" Skylar is not your typical girl from Creek View. She has an actual chance of getting out. (Without becoming pregnant first.) Try as she might to stay out of trouble, it still found her. In the form of a Marine. Josh is back in Creek View after his tour in Afghanistan and and everything is different. Especially him. As the summer goes by, both Skylar and Josh see what's really important to them. "...it's okay to be proud of yourself, Josh." I loved all "the feels" this book brought on. I laughed out loud, I cried, I got mad, I felt EVERYTHING while reading this. I was fully immersed in this story. Enough to cry real tears and talk back to the book like Skylar would jump from the pages and do what I told her. "you can't have the light without the dark, right? Maybe our darkness was necessary for other people to see their light.'" I also loved the beautiful, lyrical way this story was written. Although the main character of this story is Skylar, there are some chapters from Josh's POV that are super intense and give us a look into his feelings. Though they sometimes hurt to read, I loved that Demetrios gave us that glimpse at Josh. This way we were able to see why he did what he did although we may not have agreed with it. Yes Skylar may have been the MC, but my favorite voice of the story was Josh's. "What am I supposed to do when I'm bad for the one good thing in my life?'" As far as Josh and Skylar together there were so many hick-ups but I rooted for them the entire way. Both Josh and Skylar needed someone to be loved by and I wanted them to find it in each other. There were many times I was upset that they didn't do what I wanted them to, but at the same time, I understood. But trust me, the times they finally get it right, it was electrifying. Josh is seriously swoony and he and Skylar together captured my heart. "Love is medicine and dreams are oxygen.'" 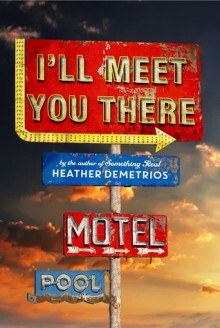 Heather Demetrios is quickly becoming one of my favorite contemporary romance authors. 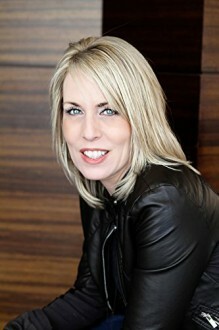 She dares to write outside the box, from teens with huge families that make it to television to teen amputated war veterans. Her writing swept me away to the trailer park in Creek View and even though Skylar was so intent on leaving, I didn't want to.